The latest version of OS X, Lion, has been out for a few weeks and it’s a great operating system. 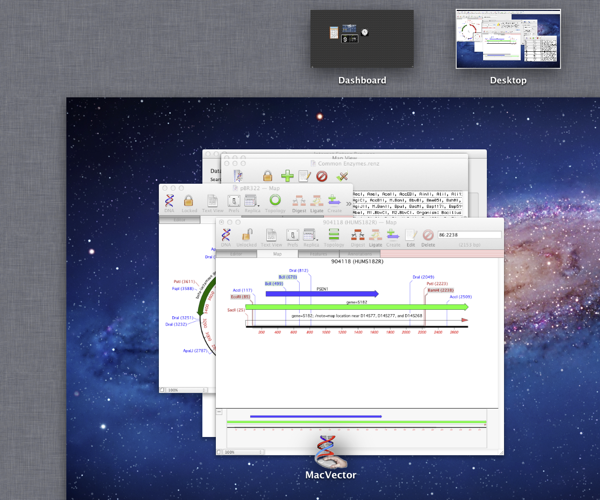 MacVector 12 has been tested and although not yet officially supported, it works great.. Nonetheless even though we’ve not yet come across any issues we are committed to fixing bugs. So if you are running MacVector 12 and have already updated to Lion then please do not hesitate to email us or comment on this blog if you find a bug, even if it’s just a little niggle. If you are not running MacVector 12 then there are some issues. Lion does not include Rosetta and because of this if you are using MacVector 9.5 or earlier then this will definitely not work on Lion. MacVector versions between 10, 10.5 and 10.6 may still work although these have not been tested yet. MacVector 11 and 11.1 appear to work although it is possible that there are issues. So before you upgrade your Mac make sure you upgrade your copy of MacVector and discover why MacVector 12 is the best and easiest to use version of MacVector yet! – Subcloning: A point and click interface allows you to select RE sites, digest, then ligate into a vector with ease! Compatible sites are highlighted with a Klenow blunting tool if there are none. MacVector also supports Gateway and TOPO cloning. – Comparing sequences: You can align cDNA/mRNA/EST clones against genomic sequences, Blast your sequence, search and align against multiple sequences on your hard drive, generate dot plots and much more. Assemble reads against a template sequence with easy SNP analysis. – Open your data from many sources: direct from Entrez, from Vector NTI databases, from many sequence formats (e.g. GenBank, EMBL, GCG etc) or from sequencing facility files in Fastq, ABI or SCF formats. – Sequence Annotation: A wide array of algorithms combined with the drag and drop of results to your sequence makes it a quick process to annotate your blank sequence with features. Auto annotation lets you quickly annotate new sequences based on your own collection of curated sequences. – Designing primers: Click on a feature in your sequence, run the analysis and get a ranked graphical list of the best primer pairs to amplify that feature. You can also design internal hybridisation primers for realtime PCR analysis with additional functions to check/design sequencing primers. – Sequence assembly: there are tools to easily create de novo assemblies in a few steps or simply compare your sequencing results against the template of your new construct. Remember all upgrades of MacVector also include 12 months of free upgrades. This means upgrading now means that you will receive MacVector 12.5 which is due for release later this year. 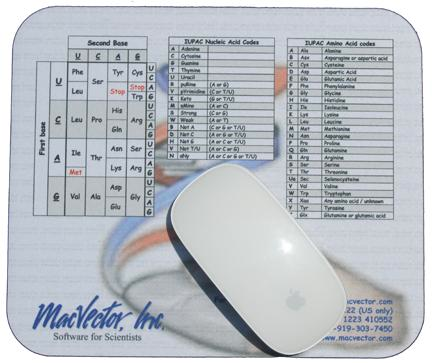 If you are not convinced about upgrading your copy of MacVector then if you request a quote by the end of August we’ll send you a mousepad to help you remember that which codon stands for Aspartate…..
…and when we receive your order we’ll add a floatie for your water baths! 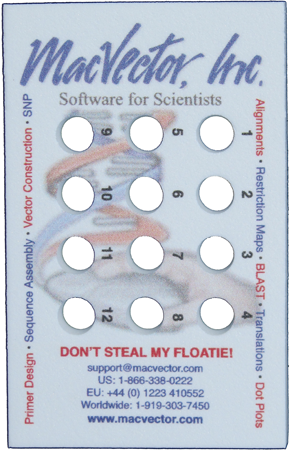 *For upgrading MacVector 8.1 or higher in the US. Please contact sales@macvector.com for other pricing. This entry was posted in General, Releases and tagged offers, OSX. Bookmark the permalink. Both comments and trackbacks are currently closed.